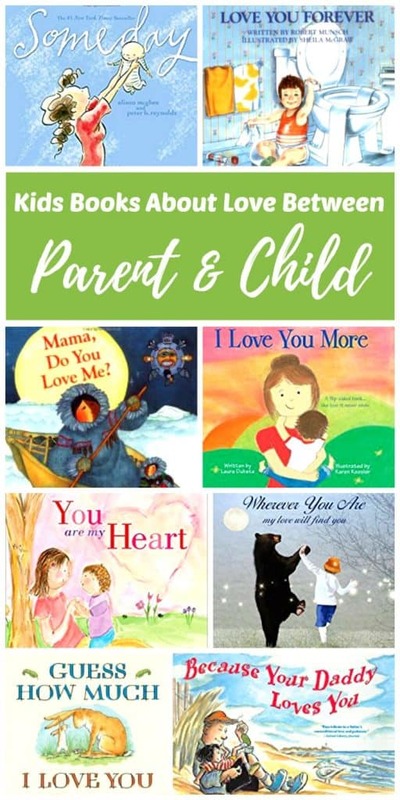 Reading kids books about love between parent and child with our children is an easy way to share the unconditional love that we have for them. I love using books as a way to teach children. These sweet classic books make it clear to our children that we love them no matter what they do using simple lyrics and stories that we can all relate to. You may also like Kids’ Books That Teach Important Life Lessons. 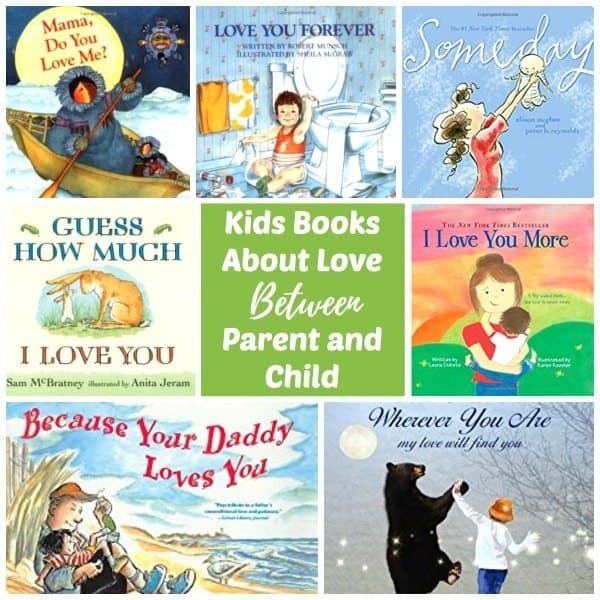 Below you will find a collection of my families favorite books about love between a parent and child. Search for these at your local library or use the affiliate links I have provided below to purchase your own. Read one with your child today! Little Nutbrown Hare shows his daddy how much he loves him: as wide as he can reach and as far as he can hop. But Big Nutbrown Hare, who can reach farther and hop higher, loves him back just as much. The primary message of this book is about a parents love for their child–no matter what happens or where you go, my love will be there. It perfectly describes the limitless love we parents have for our children. The combination of a heartfelt message, rhyme and rhythm, childlike illustrations and its cleverly conceived flip story, which ends in the middle and starts from either side, and has touched so many readers’ hearts. I did not like this book when I first read it. I thought it was a bit freaky and weird. And then I had my own child. Now I tear up every time I read it. This sweet book encourages parents to savor not only their children’s firsts, like first steps and first words but the lasts as well. With the tenderness of a mother speaking directly to her child, Karen reminds us not to miss last days of kindergarten and last at-bats in Little League amid the whirlwind of life. The bestselling and beloved story of a mother’s love and dreams for her child. You will need your tissues for this one too. This is a book that grown-ups will love reading over and over to kids about the love and hopes we have for our children. A loving and truthful message that will endure for lifetimes. I Wish You more is a beautiful, lyrical book about the many wishes that a parent has for their child. Get your tissues ready! An inspiring book that puts into words the joyful love you feel, offering a sweet, magical moment you can share with your child again and again. Settled into their favorite cuddle spot, Mama reassures her child that he was wished for, prayed for and waited for. And that he is far more beautiful and precious than she could have ever imagined! I Wished for You: An Adoption Story follows a conversation between a little bear named Barley and his Mama as they curl up in their favorite cuddle spot and talk about how they became a family. A reassuring tale of the love and affection of a parent. The imaginative son turns himself into a meat-eating dinosaur, a swamp creature and much, much more before being satisfied with the fact that no matter how stinky he is or how slimy of a creature he could possibly be, he is loved and nothing will change that. This endearing book demonstrates the depth of a mother’s love for her child as her young bunny wants to run away from her. Each time he imagines he is something different and his mother matches his imagination by becoming whom or whatever is needed to find him. He learns that no matter how hard he tries to run away his mother’s love remains steadfast. This intriguing children’s book entertains from beginning to end, while teaching the child about love, and caring. Different animals are introduced as the child learns about wildlife, and how a mother cares for her young. This book is about the relationship between mothers and their children. In it, we meet five animal mothers that express the unconditional love they have for their babies in song. The text is sung to the tune of familiar lullabies with the words re-written into loving sentiments that a mother has for each of their children. A family favorite bedtime story in our home. This beloved story of a child testing the limits of her independence and a mother who reassuringly proves that a parent’s love is unconditional and everlasting. This spot-on pairing of words and images is a warm, reassuring, and humorous tribute to dads everywhere. When a little boy and his mom go camping, mini-disasters abound, and there are lots of opportunities for Mom to step in and fix everything. But instead, with a loving touch, this mommy shows her child ways to do things for himself, going far to encourage her child’s independence. And there is still plenty of opportunity for snuggling under the stars. This is the perfect book for families to share together to remind children how much they are loved, each and every day. Elmo and his Sesame Street friends show us lots of fun ways to say I love you in this wonderful little lyrical book. Celebrating the love between a parent and a child, this bilingual Spanish-English book features a host of animals and the things they love about each other. Perfect for babies, toddlers, preschoolers and as a reminder to the big kids in your life. One little monkey discovers that the love between parent and child grows day by day no matter what! When you love someone, you want the whole world to know. Through good times and bad, rain or shine, love is unconditional. A very sweet lyrical book about all the ways a parent shows unconditional love for their child in the everyday moments. Reading kids books about love between parent and child with our children is an easy way to share the unconditional love that we have for our them. These sweet classics will make it clear that we love them no matter what they do using stories that we can all relate to.